Dark, brooding lines and a stripped-down hot-rod essence make the Speedmaster a standout middleweight cruiser. But more can sometimes be more. And while the lean Speedmaster retains its low-slung and nimble street prowler chassis it now has more low-down torque thanks to its new 865cc, air-cooled, twin cylinder engine. And due to the 270 degree firing-interval each power pulse from each piston is delivered in a seamless, languid flow that hooks the fat 170-section rear tyre to the road. The flat 'drag' style handlebars, double front discs and wide-set telescopic forks ensure a sporty and controlled ride. As well as flawless function the Speedmaster has an elegant form all its own. A satin-black engine finish and near-solid 15-inch rear wheel add to the show and whether on the move or at a standstill the Speedmaster turns heads, hard. The Speedmaster has the edge. It's built for city streets and twisitng roads with an engine that inspires and a chassis that excels. Above all else it's been built to perform. 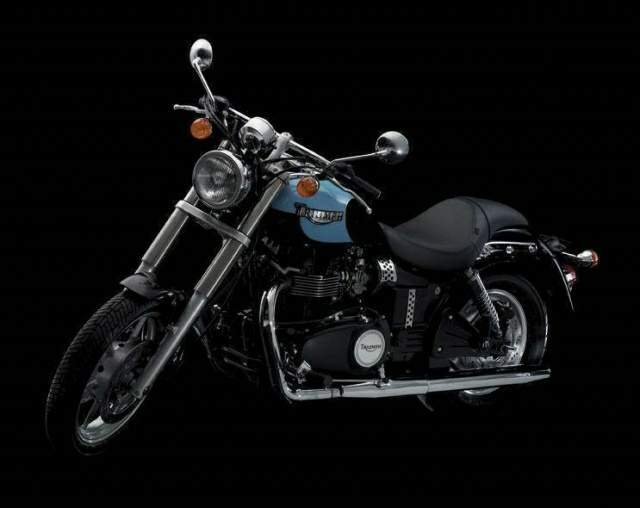 Eat up the miles with Triumph's stunning range of Cruisers. Each a perfect balance of power and performance and including the amazing Rocket III. The most impressive production motorcycle in the world it's already a modern legend. Speedmaster may seem an odd name for a bike that isn't a race rep. But Triumph is harking back to its '60s glory days and aiming for a big slice of the cruiser market It isn't just people who were around back in the '60s, like AMCN's esteemed ed, who are interested in things retro. Younger riders too are buying history. Triumph says cruisers make up 40 percent of the world-wide market so it's no surprise that it's trying to cut itself a piece of the action. 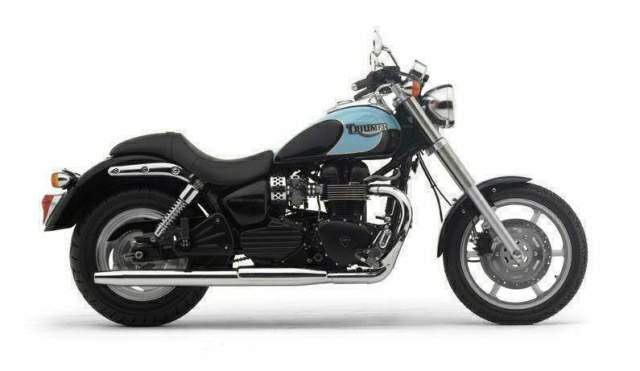 So we first had the Bonneville, unashamedly taking the styling of one of the most famous bikes to wear the Triumph badge. It put aside the modern triple engine for a parallel twin, complete with deep air-cooling fins on the cylinders. 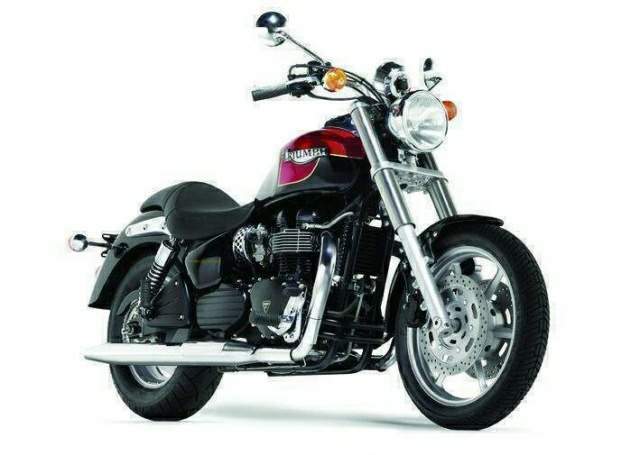 That led to the Bonneville America - a smart move since Brit bikes have always found a ready market in the US. Interrupted by the fire that destroyed much of Triumph's Hinckley factory, the designers soldiered on with typically British stiff upper lips. The Speedmaster is the first new model to come out of the factory since the fire, so it's important to Triumph in many ways. Beneath the classic looks, there's a modern heart. The air-cooled engine has an oil cooler tucked discreetly on the frame. There's secondary air injection to burn free radicals in the exhaust gasses and keep within emissions laws. And it's a double overhead cam, eight-valve engine - the original company would barely recognise it. While twin balance shafts keep vibration down, the firing order has changed to 270 degrees, so there's a classic soundtrack with the classic vibe. The gearbox is a feature of Triumph's unit construction design, and is essentially lifted from other models in the range, with one cog missing to make it a five-speed 'box (it's fifth ratio that's been dumped). Compared to the America, overall gearing is lower, giving sportier performance off the line, but higher cruising revs. The raked out forks and flat, pulled-back 'bars give a more aggressive look than the America and Triumph is pulling no punches - this is in a head-to-head sales battle with Harley-Davidson. Swinging a leg over the seat makes one thing instantly clear - the riding position is sorted. The saddle is low, the footpegs far enough forward that riders used to sportsbikes can't find them. The 'bars, too, are low and wide. The key is behind your left thigh. While the starter button is where you expect it, above it on the righthand switchgear there's no light switch, just a filler with the Triumph logo - lights are always on. There's no pass light switch, either. The exhaust note when you hit the starter is disappointing. You can hear the valvegear and the cam chain just as much, but Triumph has an answer for that in the aftermarket catalogue, with a choice of two "not for road use" pipes - a fruity, slash-cut set up, and a loud full length pipe, resembling the original. In traffic, the Speedmaster proves more nimble than the forks suggest, happily carving a line at walking pace without the heavy steering that some cruisers suffer. U-turns require a bit of concentration as the front wheel wants to fall into the turn, but it's easily held on line. Moreover, it's a shock to look at the spec sheet and see "Dry weight 229kg" 'cos it doesn't feel it. Out of traffic and on the open road, 100km/h cruising sees the tank-mounted tacho showing about 3900rpm in top gear. From there, you've still got pretty much maximum torque - the torque curve is claimed to be almost flat from 2750rpm, peaking at 3500revs with 6.12kgf-m, and carrying on to the peak power of 62ps at 7400rpm. The red line starts at 7500rpm, but it revs just past 8000rpm if you want. You won't want, though, as the engine responds best to a more relaxed style. After all, it's a cruiser, so treat it as such and ride the torque. Despite the aggressive looks, the large-ish capacity twin engine won't rip your arms from their sockets if you abuse the throttle. That's probably where the high weight makes itself felt. There's no fear of accidental monos with the Speedmaster, but acceleration off the line is rapid enough up to 110km/h, where you'll see just 4400rpm on the dial. At that speed, there's a mild tingle through the bars. After a short stint (about 50km) I was feeling a slight numbness in my thumbs, but a little shake of the arms sorted it. Off the highway and on to some interesting back roads, there was little need to slow down. The Triumph handled the turns well, and with the more involved riding, the vibes disappeared. Around the twisties, there's a pretty decent degree of lean available, and it gets over well. Okay, it doesn't turn in as sharply as a sportsbike, but it suits the style. You know when it's had enough, too. In righthanders the footpeg hero-blob scrapes noisily, while in lefts, it's the chrome sidestand, making a more pleasant grind. Power from the front stopper concerned me, however. Triumph has made some of the most powerful brakes around, but the Speedmaster needed a full set of four digits to squeeze some stopping out of it. Using only two fingers, the bar came back to my knuckles and all I got was speed retardation. Riding a different bike saw a massive improvement. It appears a little bleeding may have been needed on the first bike I rode. Feel was there in abundance on all the bikes, which is a good thing, but there's a lot of lever travel. Use the brakes hard and the front forks dive like a Collins class sub. The build quality is better, though: the movement is controlled despite the soft set up and there was no sign of a leak! Braking on a really bumpy section of road, it was easy to get the forks bottoming and the front wheel skipping. But back off the brakes and it quickly comes under control. The same goes for bumpy corners. The soft suspenders let the bike shift about on bumps mid-corner. But once off them, the bike rapidly settled, even when I got bounced out of the seat. Triumph has priced the Speedmaster starting at $15,290. That's gonna take some selling against the likes of Harley's XL883R Sportster at $13,320, or Honda's $12,390 VT750D. There's already a host of aftermarket parts, including pipes, tank graphics and screens, to individualise your bike. First choice is whether you want it in red and black or yellow and black.